With so much noise on romantic love, quite a number of people believe that finding the right man or woman, will somehow, complete them. What you don't know is that, another human being can never do all the things you expect You have got to do them yourself by falling in love with your being. We are so busy wailing for somebody to love us, that we have almost forgotten that person that need to be loved -YOU. When you love yourself, then, you will always be around someone who loves you. Just as you go out of your way to make other people feel good, you should also prioritize making time to do things that make you feel good. This is a time for loving yourself; go for it and make the most of it. It may sound ridiculous, as we offen think of falling in love as a process to specific dating but in actual fact, we fall in love with people, places books and even state of mind. Though there is no wrong way to loving except not loving at all. The issue is that we become too indifferent, that we see ourselves as being plain and not able to see what other people see in us. Right from teenage age, ladies dream about falling in love. in as much as there is nothing wrong with this, it does not make you egocentric to want to spend some quality time on you. It is significant that we never get caught up in loving others that we forget to love ourselves first. Start learning how to appreciate yourself, embrace your oddity because these are what make you. See the beauty in your birth marks, learn to enjoy time with your thought rather than shying away from them. Showing self love to your person can start from knowing what your needs are, how to meet Ihem, acknowledging your value and self worth, embracing everything about yourself - the good and the bad if any. 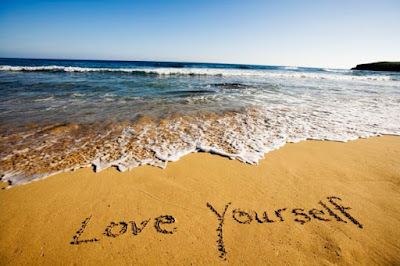 Falling in love with yourself, gives you a deep appreciation of your own worth and capability. This also means you truly like yourself. "To love oneself is the beginning of a life-long romance" says Oscar Wild. Lack of self-love can lead to problems such as a lack of self confidence, insecurities, jealousies, unhappiness and dislike. And if we allow this cycle of negativity to go on, we might end up pushing others away and the love we crave from them, might not be around for long. So loving yourself is important from this angle. When you love who you are, those not so great parts of you, actually lay the foundation for building a life filled with acceptance, love and understanding. Know that the more you show yourself love, the less you project judgement and criticism on others, the less likely you are to be content with unhappy relationship, the more you gravitate towards the things and people that bring positivity into your life. GET A DIARY: One of the most powerful way to know yourself is to write down your thoughts. Even if it is a few sentences a day, you never know what you might learn about yourself. WORDS OF AFFIRMATION: Always give yourself a compliment. Get in the habit of acknowledging the good things about yourself as you notice them. GO TO THE MOVIE ALONE: Treat yourself to a personal date, a night off from your busy life as one deserves a break once in a while. There is no greater company than you. Take yourself out to dinner, who says you can eat at a restaurant and order your favorite meal without a date? Giving back not only helps others, it can also help you. look for what interests you and get involved. MAKE A DASH GOAL BOARD: What do you want out of life? What are your goals? Get hold of old magazines and cut out any picture or write-up that represent you or your aspirations. Gum them on a goal board and put on your wall to remind yourself that your goals are 'within your reach and that you are worthy of your aspirations. Take a walk around your neighborhood or you go for hiking. Get outside, breath in fresh air, take a look around you and think about how you fit into it. Get into your car and turn up the music and go for a drive. This will do the trick, drive for few miles to clear your mind. TREAT YOURSELF TO SHOPPING: You know that perfume you have been dreaming about? Give yourself some treat, irresponsible spending won't help you. Love yourself but, it is cool to occasionally remind yourself that you deserve to give gifts to you. If possible travel, it does not have to be a long trip, just visit those places you have never visited before. Throw compromise out of the window and travel alone so you can see exactly what you want to see. SETTLE FOR A LONG BATH: Light few candles, turn on some relaxing music, let go of your stress and conflicts as you soak thus pampering your body. Whatever you finally decide to do, the whole idea to falling in love with yourself is you learning to appreciate and accepting yourself. "You cannot be lonely if you like the person you are alone with." Note that loving yourself is not about spending all of your time alone, it is about the confidence inside to love all of you especially, the parts that might be different from the people around you. This is 'The world has : YOU. You cannot find true love with someone else, until you find it within yourself. So live your best life by loving yourself.